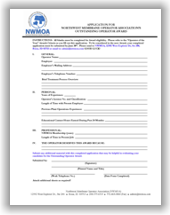 The Northwest Membrane Operators Association (NWMOA) formed March 26, 2012 is the newest affiliate of AMTA (the American Membrane Technology Association). I’m pleased to report to you that membership in this new organization is growing quickly. That means our message is getting out. 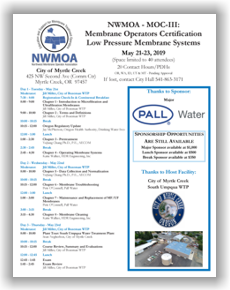 NWMOA is the only organization in the northwest that concentrates exclusively on the hands-on training and education of membrane plant operators. But, what other reasons are there to join NWMOA? Networking and information exchange – members have access to up-to-date information on worldwide operating data, groundbreaking water research programs, water user needs, products and manufacturer services. Please feel free to get involved in the organization. Our committee chairs are always looking for fresh ideas – and an extra pair of hands! Please tell your friends, colleagues and customers about the value NWMOA brings to you and your organization. Please continue to visit our website at www.nwmoa.com to see what’s new. Don’t miss out on the opportunity to learn, contribute and network at the workshop and full conference. Thanks again for considering NWMOA. We look forward to seeing you at one of our events soon.